Dynamic design, emotionally charged, innovatively executed, this One Piece Bartolomeo SCultures Big Zoukeio 5 Vol. 3 Statue became a fan favorite at the Banpresto Figure Colosseum figure design tournament that was held at the Jump Festa event in Japan. 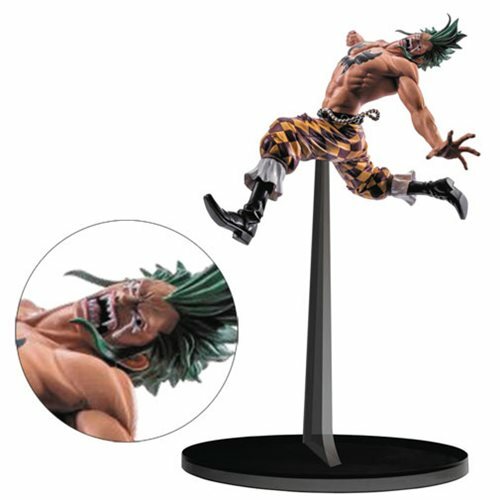 This amazingly captured moment of Bartolomeo from the legendary One Piece series has our fighter tearfully recalling Luffy's motivational triumphs as he lays down the epic finishing blow on Gladius. Statue measures approximately 5 1/2-inches tall from boot to hair tip. Ages 15 and up.